RT Holidays are a family-run business that make great service, integrity, quality and affordability part of everything they do. They specialise in tours to the Far East and Middle East and their portfolio of tour destinations is ever-growing. They approached us to help them rejuvenate their dated brand, design a new, responsive website and develop a simple booking process. We teamed up with our friends and stellar brand architects at Tangerine to take the existing, dated RT Holidays brand and create a stunning brand refresh and new company style guide. The new brand continues to be rolled out across stationery, brochures and national newspaper and magazine ads. 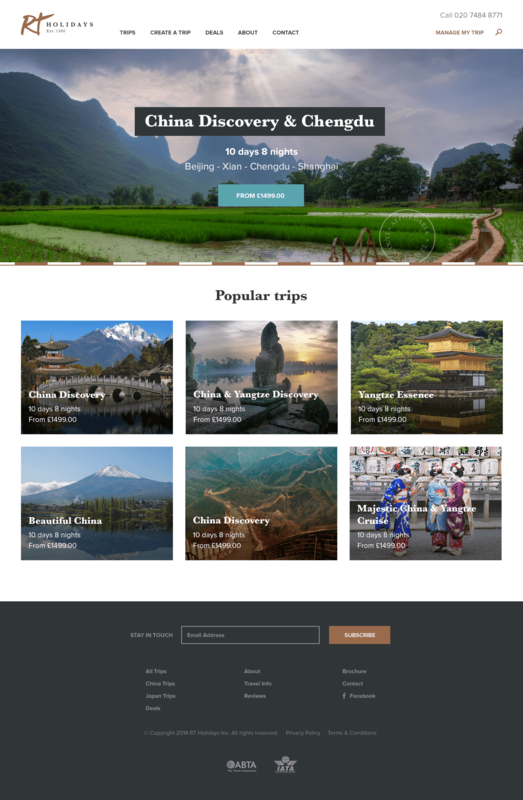 With the website, we tried to modernise the existing look and feel and inject an elegant and simple sense of travel into the online experience. Previously, all bookings were made by email between RT holidays and their clients after initial contact was made. 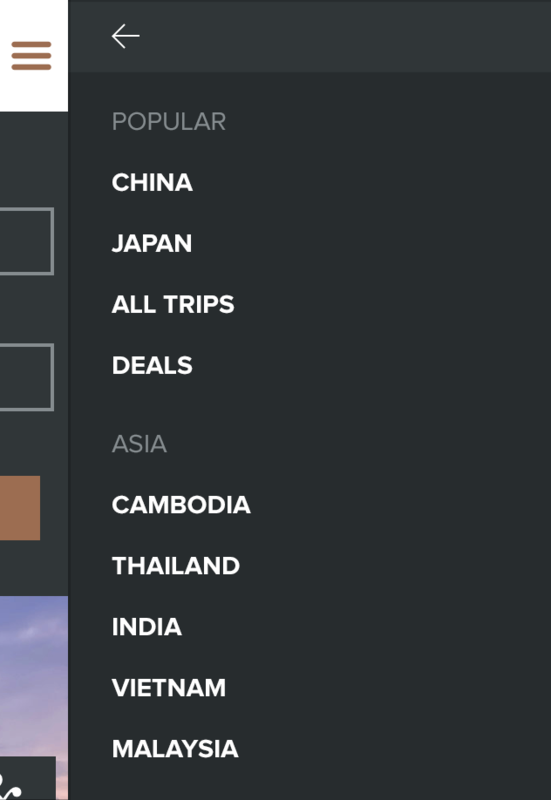 As well as rebranding the site, we introduced new online booking functionality for the first time. With so many of their visitors using mobile devices, all pages had to be fully responsive. 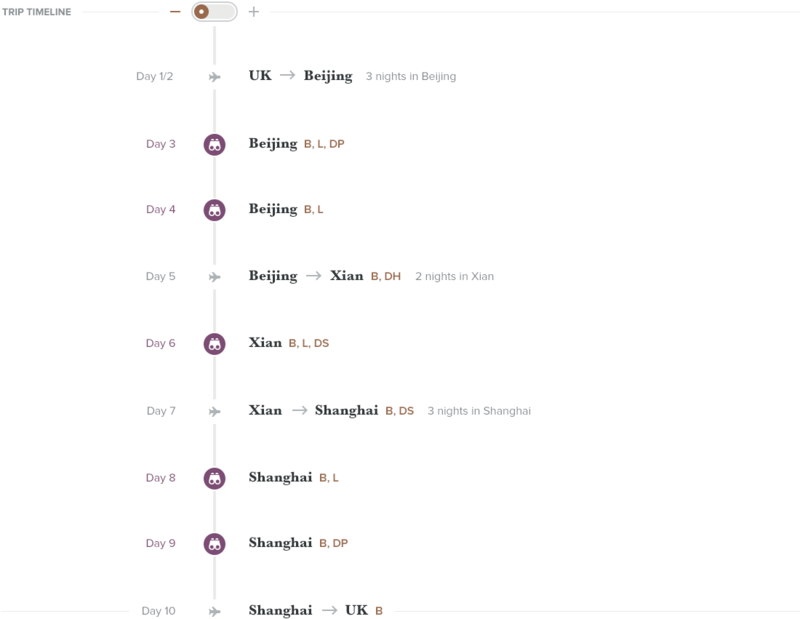 Using the clients considerable experience of the travel tour industry and their in-depth knowledge of their users, we designed a prototype for their new booking process using the Foundation framework. We worked very closely with them to constantly iterate the design using feedback from their users. 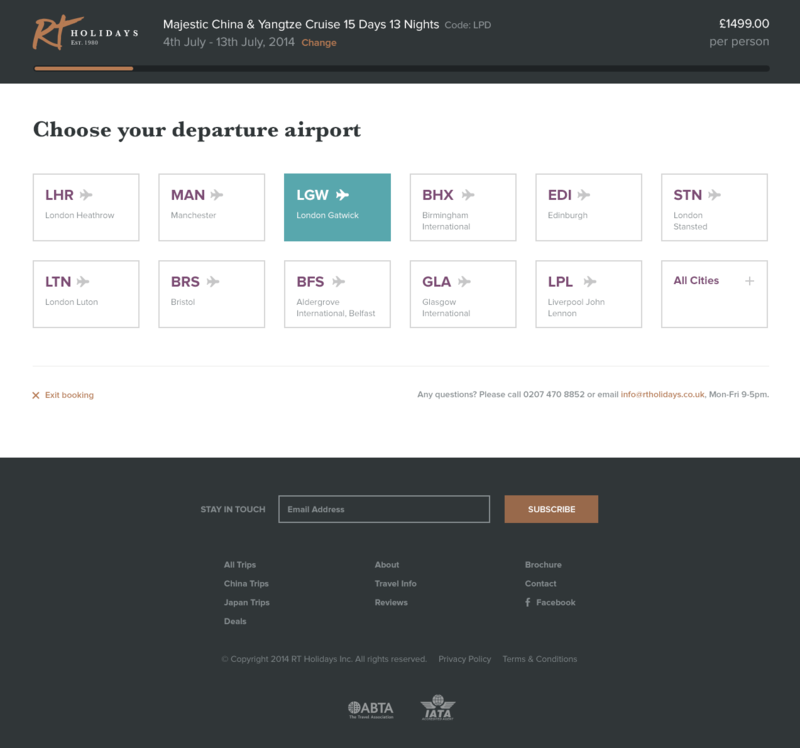 Once we were happy, we slowly introduced the new brand and designed a sample of key booking pages to get a feel for how we could develop the web style guide. A real focus on clarity meant the detailed booking process was organised into a series of simple stages that were easy to follow on any device. 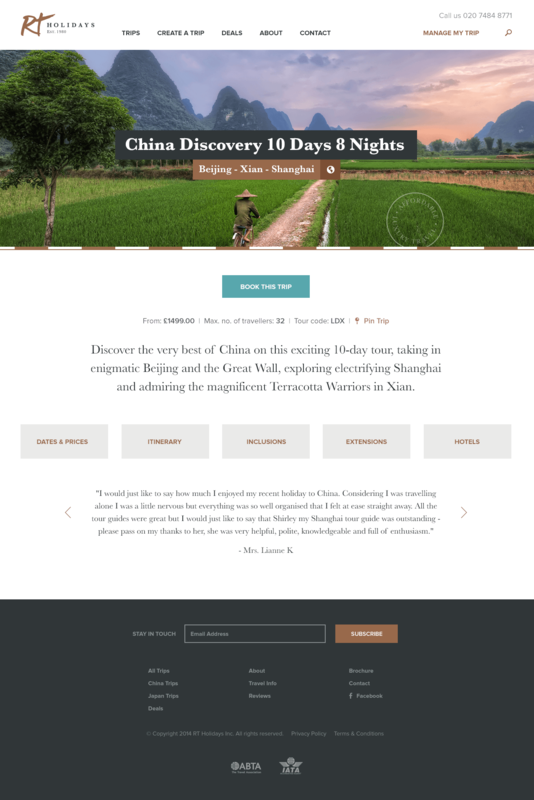 We worked very closely with Andy Kleeman at Superfantastico to develop a full set of responsive page templates and a comprehensive web style guide for delivery to the clients in-house development team in China. The team continue to work towards releasing the full site. Our new website is a breath of fresh air. We are so pleased with the work from Supereight and wouldn't hesitate to recommend them to anyone. Not only are they creative, but they are efficient, professional and a pleasure to work with. I can't thank them enough. Let's start our own journey together. Get in touch.